This April, there are three opportunities to make wishes come true for children in Ohio, Indiana and Kentucky when you attend a BIG Wish Gala. Make-A-Wish Ohio, Indiana and Kentucky helps kids throughout these states who suffer from critical illnesses. You can help grant wishes to children in Akron, Cleveland, Cincinnati, Columbus, Toledo, Indianapolis, Fort Wayne, Evansville, Louisville, Lexington and more when you attend either of the Make-A-Wish Ohio, Kentucky & Indiana BIG Wish Galas in Columbus, Indianapolis or Cleveland. If you live in the Columbus area, the Columbus BIG Wish Gala is the perfect opportunity for you. Enjoy an evening out at the Hilton Columbus Downtown (401 N. High Street), while also helping to grant the wishes for kids in Ohio, Kentucky, and Indiana. The event will feature a sit down dinner, a live and silent auction, and inspirational wish stories from children and families who have benefited from Make-A-Wish. The event begins at 6 p.m. The Indianapolis BIG Wish Gala takes place at the JW Marriott Indianapolis (10 S. West Street), starting at 6 p.m. Individual tickets are $400 each and sponsorships are available from $4,000 to $25,000. If you are interested in becoming a sponsor of our 2016 event, or to RSVP, please contact Kelsey Leichtnam at 317-522-4082. 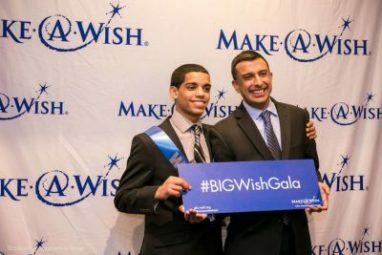 The Cleveland BIG Wish Gala at the Westin Cleveland Downtown (777 St. Clair Ave. NE) will provide guests with the opportunity to experience the Make-A-Wish mission firsthand. The evening starts at 6 p.m. and includes dinner, a live and silent auction and a few more surprises. Guests will also have the opportunity to hear stories of inspiration from children and families whose lives have been forever changed by a granted wish. You can attend the event by purchasing tickets or tables. Individual tickets are $300. RSVP today to Michele DeScioli at 216-367-5655. Sponsorships are also available, and range between $3,000 and $15,000. Can’t Attend But Still Want To Make Wishes Come True? If you are unable to attend either of these fantastic events, you can still help Make-A-Wish Ohio, Kentucky, & Indiana by donating your car, truck, boat, motorcycle, or camper to Wheels For Wishes. Wheels For Wishes is a 501(c)(3) nonprofit organization that benefits Make-A-Wish through our car donation program. Donate your unwanted vehicle and it will be recycled or auctioned off to grant more wishes for local children. To donate a vehicle, please call 1-877-431-9474 or fill out our online car donation form. Vehicle donations are tax-deductible and include free pick-up and towing of your vehicle, anywhere in your area. Call us today to donate your vehicle!